People take the concept of "infinity" a little too lightly, but empirical evidence has -- at least thus far -- proven that the fun times and memories are literally limitless with the Never Summer Infinity Snowboard. Created as a capable all-mountain weapon for aggressive lady shredders, the Infinity Snowboard handles hardpack, powder, and even park laps with exceptional prowess. 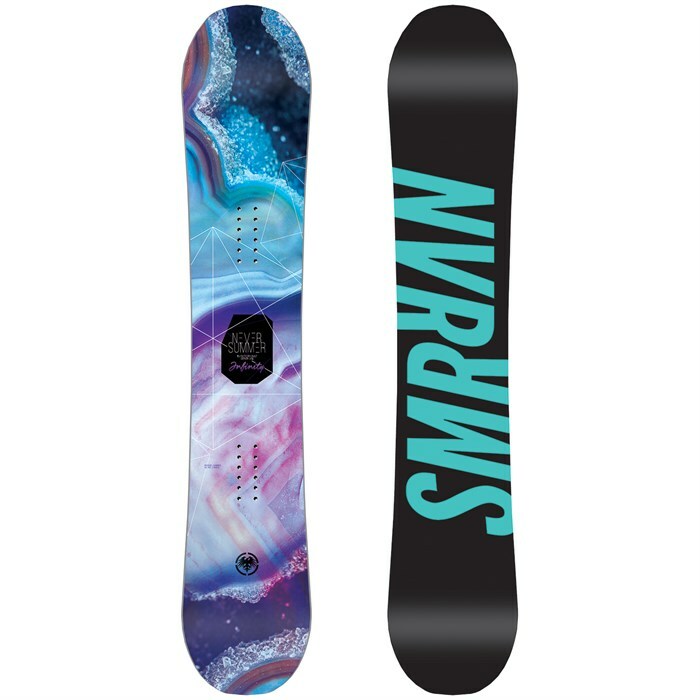 Take your riding and fond mountain memories to infinity and beyond with the Never Summer Infinity Snowboard. Original Rocker Camber  This profile is shaped for a surfy and playful feel while maintaining superior performance and versatility. Vario Power Grip Sidecut  Vario Power Grip Sidecut utilizes multiple radiuses creating extra contact points to enhance edge hold. A flat section in the rocker area provides a broad contact point when flexed, however when unbent allows the board to track straight and not catch. Flanking this straight section are two shallow radii which provide the second and third contact points. Towards the ends of the sidecut are deep radius which renders quick turn initiation and the final contact points. NS SuperLight Wood Core  Using a sustainable genetically modified Poplar wood fused with a durable Birch hardwood, NS has created the lightest weight yet durable core on the market. The NS SuperLight Wood Core is CNC sanded in their custom wood working facility to a fraction of a millimeter. A tailored flex is perfected, giving their snowboards unequaled performance. Carbon VXR Laminate Technology  Carbon VXR extends carbon fiber V's out from the inserts to the effective edge for quick response while stiffening the board torsionally. Additionally, V's are positioned to the ends of the board providing maximum boost and pop when loaded up. This is an ideal layup to transfer energy to the end of the effective edge, tip/tail and still give the board a softer more forgiving mid-flex for torsional control. Bi-Lite Fiberglass  Bi-Lite combines many of the strength characteristics of STS Advanced fiberglass with an ultra-light glass fiber matrix. This delivers incredible freestyle and freeride performance without sacrificing durability. RDS 2 Damping System  This lightweight system uses three narrower laminated dampening layers that provide the perfect combination of vibration, absorption, and stability. RDS 2 is the perfect balance of freeride stability and freestyle liveliness. Elastomeric Underfoot Stabilizers  Elastomeric Rubber Stabilizers directly below the mounting area provide optimum vibration absorption and increase high-speed stability while reducing foot fatigue. Sintered P-Tex Sidewalls  Never Summer was the first snowboard company to use and perfect Sintered P-Tex Sidewalls, and they've never seen one crack. Unlike conventional ABS sidewalls that have a tendency to crack in colder temperatures, Sintered P-Tex Sidewalls maintain their integrity at any temperature. Durasurf Sintered 4501 Base  Crown Plastics has been the industry leader in sintered materials for over 36 years and has created the Durasurf 4501 sintered base exclusively for Never Summer. This high-density base is extremely fast and will provide unmatched performance and durability. Premium Topsheet  The Premium Topsheet is a very durable, lightweight, scratch and chip resistant fiber backed thermoplastic. The premium topsheets also provide more grip than other topsheet materials, working as a built-in stomp pad. These premium topsheet materials include Never Summer's Carbonium Topsheet, Matte Topsheet and TruGrit Topsheet. P-Tex Tip/Tail Protection  Boards with P-Tex Tip/Tail Protection have UHMW plastic, or P-Tex which is a softer molecular material that not only seals and protects the wood core, but also absorbs vibration and impact. All-Mountain All-mountain snowboards are designed for exploring the whole mountain. They are your go-to for a snowboard that will do anything. They feel at home on groomers, powder, park runs and almost anything in between. The vast majority of snowboarders choose all-mountain boards for their great versatility. If you’re just getting started or unsure of exactly what you need, an all-mountain snowboard is a great choice. Intermediate-Advanced Whether you’re a progressing intermediate exploring new runs and terrain, or an accomplished rider seeking new thrills, the majority of skiers and snowboarders fall into this level. Intermediate to advanced skis and snowboards may be somewhat wider or stiffer than beginner-intermediate skis and snowboards, usually with a stronger wood core and sandwich sidewall construction. Intermediate to advanced boots and bindings range from softer flexing freestyle options to stiffer choices built for stability at speed. Camber/Rocker/Camber Camber/Rocker/Camber is a profile that’s specific to snowboards and which works because the rider’s weight flattens the two cambered areas. This design produces a strong, pressured carving zone between the rider’s feet and retains pop and carving precision at the tip and tail. Medium The amount a snowboard flexes varies significantly between boards. Snowboard flex ratings are not necessarily standardized across manufacturers, so the flex may vary from brand to brand. Many manufacturers will give a number rating ranging from 1-10, 1 being softest and 10 being stiffest. Here at evo we have standardized the manufacturers' number ratings to a feel rating ranging from soft to very stiff. Generally you will find flex ratings of 1-2 as soft, 3-5 as medium, 6-8 as stiff, and 9-10 as very stiff. Flex ratings and feel may ultimately vary from snowboard to snowboard. 3 Years Visit https://www.evo.com/warranty-policy for more info.